Ever since Captain Francois Mingaud developed the first leather pool cue tip in France in 1807, pool and billiards players have been trying to decide which tip is best for them. The options back then were very limited, but today we have dozens of choices when it comes to tips. In this article, we discuss the different types and hardness options for pool cue tips and give you the insight to make the right choice for you, and your game. This is one of the most common questions I hear when I am asked about tips. Solid leather tips are made by taking a thick piece of specially tanned leather and punching a single pressed layer from it. Solid leather tips have many good qualities that a lot of players like. These tips are generally inexpensive and they give a very distinct solid hit when striking the cue ball. Some of the more popular brands are LePro, Elkmaster, and Water Buffalo which are available in precise sizes so you can buy them to match your ferrule and install with minimal trimming required. Solid leather tips are a great option for replacements one one-piece house cues. Solid leather tips do have a few drawbacks, however. Inconsistencies in the leather can mean two identical tips from the same brand may play different. Also, the solid leather tips compress more and become misshapen faster, so they require more grooming to keep them tip maintained. Solid leather tips can also begin to get spongy over time, usually from too much shaping or grooming. Sanding these tips can begin to tear apart the fibers in the leather and destabilize them, so you have to be careful. Layered leather tips are made from multiple thin layers of compressed leather (often from the same part of the leather so each layer is the same) stacked on top of one another, glued and pressed together. These tips are sometimes called laminated tips. Layered tips tend to last longer, hold their shape better and require less grooming. Layered, or laminated, tips offer a higher consistency in play as well. Laminated tips are stronger because of the special gluing and pressing process they undergo, and because they hold chalk better they will help you get more consistent control over the cue ball. This type of tip is also much more consistent overall. Most professional players use layered tips in this day and age. The more popular brands are Kamui, Moori, and Tiger just to name a few. What Pool Cue Tip Hardness Is The Best? Another important question I am often asked is what hardness of tip do the professionals prefer? Well, this is usually a choice you have to make from trial and error in order to find what you like the best. I personally prefer a softer tip. Softer tips require a little more grooming (shaping, etc.) because they compress more than harder tips. Soft tips are also useful if you like to use a lot of spin when playing (according to Tom Simpson and Dr. Dave they seem to get more spin because they hold chalk better). Medium tips are usually a good place to start, not so soft that you need to constantly shape, scuff, or tap the tip to hold chalk, but still has a great ability to spin the ball. Hard tips usually require very little shaping after the initial install. Hard tips can still spin the ball very well but are more likely to miscue if not chalked up properly. Try a few different hardness ratings and see what you like the feel of best. I know world class players that play and swear by each of the different hardness ratings. What Pool Cue Tip Shape Is The Best? What shape do you prefer? This is another good question. 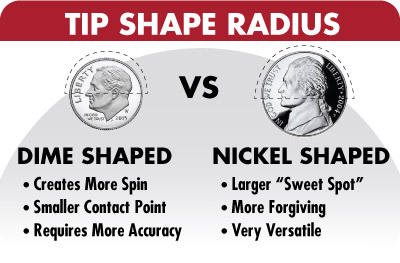 The two most common tip shapes are a nickel or dime radius. This means the dome at the top of the tip is approximately the same as the radius of a dime or of a nickel. Tips shaped to a dime have a smaller contact point with the cueball, so in theory they can create more spin, but the smaller “sweet spot” can be slightly less forgiving. I prefer a nickel shape, personally, because I find that a nickel is more forgiving and versatile. Champion Efren Reyes is rumored to like a dime radius, and people have told me that Shane Van Boening likes a nickel or even flatter radius! Again you need to experiment to see what tip shape you prefer. There are a number of great tip shaping tools out there that can help you keep your tip in good shape and holding chalk. In conclusion, tips have come a long way since Caption Mingaud. Thanks to technology and new techniques, we have an amazing array of choices. The tip is one of the most important parts of your cue, and without the proper tip a player may never reach their full potential. You might want to try out several different types. You may just find that perfect tip for you.